Welcome to the new pontoon at Ulva Ferry! 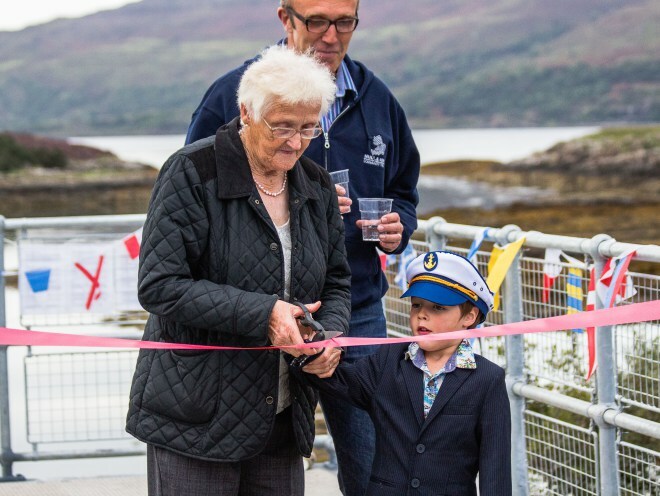 In 2013 Mull and Iona Community Trust secured funding from The Coastal Community Fund for a pontoon facility at Ulva Ferry. This is a community-run facility, employing local people. In 2011 Ulva School Community Association (USCA) was formed as part of a successful campaign to save Ulva Primary School from closure. USCA requested support from Mull and Iona Community Trust (MICT) to help prepare a community development plan and identify projects to strengthen the local community. MICT and USCA obtained funding from Highlands & Islands Enterprise to employ a local development officer, who then carried out the community consultation. One of the priority projects identified in the plan was a waterside development to provide tourism and local employment. 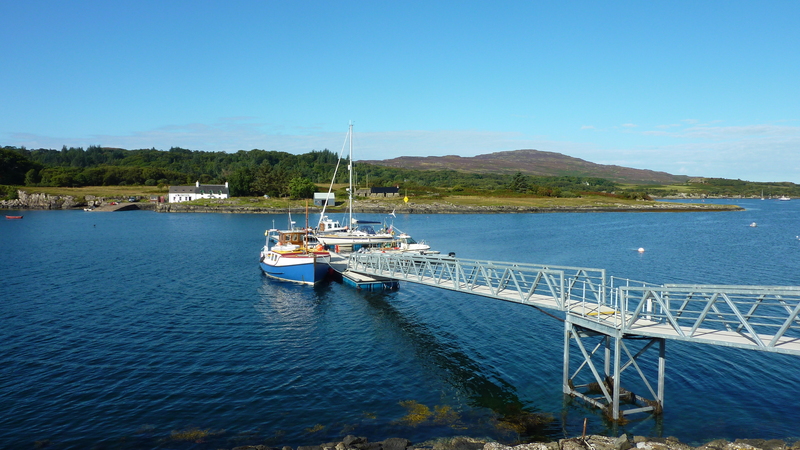 In 2013 MICT secured funding from the Coastal Communities Fund for a pontoon facility at Ulva Ferry. This community-run facility, employing local people, was opened in August 2016. MICT employs the local development officer, pontoon manager and assistants, and will take on the long-term responsibilities of the projects. In support of USCA, MICT has also introduced a successful community transport scheme and is in the process of constructing two eco-friendly affordable homes for rental. Pontoon fees should be paid in cash to the Pontoon Manager or left in the honesty box on the pontoon with the name of the boat clearly marked in the small envelope provided. Short stay dayboats/dinghies/RIB’s (under 4.5m):- up to 1 hour £1.50, up to 4 hours:- £3.00. Yachts:- overnight charge:-£2.50 (incl VAT), per metre, per night. Overnight non-commercial dayboats/dinghies/RIBs > 4.5-6m:- £1.50 metre; weekly £45; < 4.5m:- £1 metre; weekly £25. Overwintering:- <7m £100; 7-14m- £180 (1st Oct-31st March) – please contact us for details. This facility is only available for boats which can be removed by the owners at short notice in the event of severe weather. The outer section and landing stage is removed during the winter months. It is anticipated that electricity, water, fuel and WI-FI will be included in the berthing charges from around mid August. Daily and overnight charges for yachts will be discounted at 50% until services are available. Day boats, dinghies and RIBS will be discounted at 20% until services are available. The landing stage is used by tour boats from approx. 9.30am until approx. 6pm during the season. Please ensure that this is not used for berthing during these hours. It is planned that red diesel will be available from the fuel berth of the pontoon from around mid August 2016 (please contact the pontoon manager beforehand; fuel operation details to follow). We can supply to commercial customers at the rebated duty rate and also for private and pleasure craft on a 60/40 split. Our diesel contains no biodiesel. If the pontoon is full, there are anchorages in the vicinity – see charts and pilots for details. Please keep clear of, and do not obstruct the channel. Please be aware of the ferry crossing. Booking for day boats via Pontoon Manager, Mark Millward:- telephone 07557378953 or markmillward@mict.co.uk ; Booking for yachts is not available at this stage but availability can be discussed with the pontoon manager by mobile phone or VHF radio, channel 12; call sign Ulva Ferry Pontoon). If the weather conditions become extreme, boats to be taken off the pontoons. Loch na Keal Meals – 3 miles south, (accessed via community bus/Mull Electric Bikes) there is a burger van with a difference selling locally sourced produce – venison burgers and sometimes selling fresh prawns, lobster and Tobermory salmon. Tel:- 07876 773 083. Ballygown Restaurant (before 5pm) Shower, toiletries and fluffy towels. Complimentary pick up service if book for dinner. There are no shops at Ulva Ferry. From time to time locally made bread, eggs etc are available from the pontoon office, or Ballygown Restaurant will bake bread to order and provide takeaways (tel: 01688 500 113 or 07748046829). Mull Electric Bikes:- a great way to explore the Loch na Keal National Scenic Area Tel: 01688 400 499 or 07922675404 www.mullelectricbikes.co.uk Mull Electric Bikes offer a drop off/pick up service.